As a former Bostonian who frequented Flour Cafe, maybe I'm biased when I say it's home to the greatest sandwiches, but, seriously, this place makes great sandwiches--and now you can, too! Joanne Chang's recipes take simple, wholesome ingredients and make magic. In college, we used to read her cookbooks to each other like bedtime stories; even if we didn't, I'd still dream about her Triple Chocolate Mousse Cake. Favorite Recipe: Roast Lamb with Tomato Chutney and Rosemary Goat Cheese Sandwich - I have literally walked a mile in the snow for this sandwich. Tender lamb, sweet chutney, and tangy goat cheese. Need I say more? 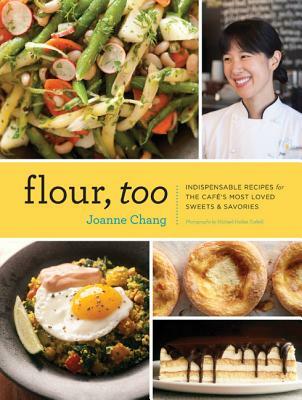 The ideal companion to Flour—Joanne Chang's beloved first cookbook—Flour, too includes the most-requested savory fare to have made her four cafés Boston's favorite stops for breakfast, lunch, and dinner. Here are 100 gratifying recipes for easy at-home eating and entertaining from brunch treats to soups, pizzas, pasta, and, of course, Flour's famous cakes, tarts, and other sweet goodies. More than 50 glorious color photographs by Michael Harlan Turkell take the viewer inside the warm, cozy cafés; into the night pastry kitchen; and demonstrate the beauty of this delicious food. With a variety of recipes for all skill levels, this mouthwatering collection is a substantial addition to any home cook's bookshelf.